Review Summary: MAHARATHI has some curiosity-value thanks to its interesting cast and an equally inviting promotion. 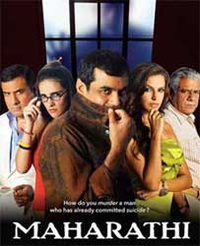 Paresh Rawal’s Subhash is one twisted character, capable of falsely convincing you of his noble-intentions. MAHARATHI has some curiosity-value thanks to its interesting cast and an equally inviting promotion. Maharathi doesn't disappoint although the bindings of theatre do keep it more of an in-door affair. We wonder why director Shivam Nair -- who directed the critically well-recieved Ahista Ahista [Images] earlier -- could not ulitise his brilliant cast to the fullest, and churn out a good thriller. The surprise of Maharathi, undoubtedly, is Neha Dhupia. As a ruthless, greedy housewife, she shows some spark of histrionics one never thought she was gifted with. Director Nair who earlier impressed with Ahista Ahista gets the classic feel right but his direction gets monotonous and unexciting and the overly placid passionless pace makes every plot turn predictable.